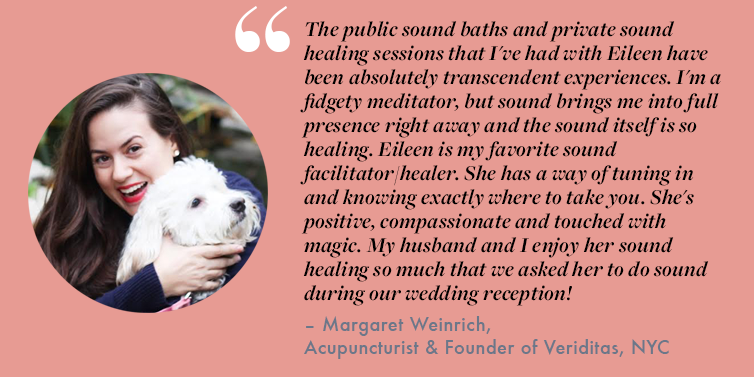 Eileen Moran is a certified sound therapy practitioner, aromatherapist, aquatic bodywork practitioner, tantric meditation teacher and event producer. She is the founder of Architects Of Experience. Architects of Experience is a retreat and event production company that curates authentic, transformational grounding experiences. AoE’s programming supports clients in their deepening of connection to the earth and the awakening of the heart. As a cancer survivor Eileen found solace in sound. The vibrations and frequencies helped her face her fears. Through sound she learned to truly become her own architect of her life experiences. From her first hand knowledge, she has no doubt about the transformational power that sound healing has for those undergoing challenges and transformation. Eileen has been studying several healing arts modalities around the world. She travels the globe facilitating transformational experiences for her clients, teaching them to tune in and liberate themselves from what blocks them, anything that's in the way of them living at their highest vibration. Her personalized work has touched a number of notable individuals, and organizations, including: You Can Thrive Foundation and the Evolver Social Movement. She regularly co-creates with experts in the field of yoga, acupuncture and movement. She has developed immersive programming with Maggie Weinrich of Veriditas Acupuncture, Naia Louise of the Prana Sanctuary and Cole Lopez of House of Magick. In addition to Eileen being a GWU Business School graduate, she is also a graduate of the Institute of Integrative Sound & Music Institute at the Open Center. She studied the farm-to-pharmacy approach to botanical medicine at the Goldthread Apothecary & Farm in Western Massachusetts. 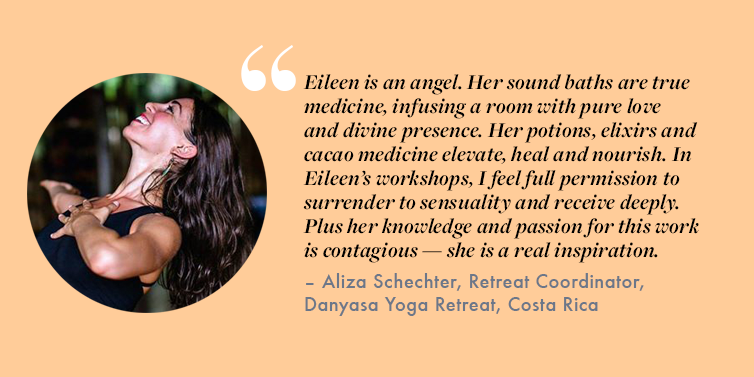 Eileen joined cacao shamans and farmers in Alta Verapaz & Lake Atitlan, Guatemala to study the ancient practice of facilitating cacao ceremonies. She has studied with masters of sonotherapy and curanderas in Mexico at the Universidad Intercultural del Estado de México (UIEM). Under the leadership of Dr. Lorin Roche, she completed a Vijñān Bhairava Tantra meditation teacher training. She is currently a graduate student of the Institute of Integrative Nutrition and is also on the board of the Healthy Breast Program under the tutelage of Sat Dharam Kaur N.D.
Join our mailing list and receive a FREE Healing Sound Mix.